What is the online Master of Engineering Management? The online Master of Engineering Management (MEM) from Ohio University is an advanced degree for engineers who want to move into leadership of technical teams, departments, and organizations. As an MEM student, you can gain an advanced understanding of the specific engineering and management skills needed to excel in your current position, create new opportunities, and grow as a respected, competent engineering leader. Benefit from an engineering-centric approach to management and technical leadership. Enhance your skills with a curriculum that equips students to lead in an engineering setting. Earn a degree from one of the nation’s leading research institutions. Complete the Master of Engineering Management program through 100 percent online coursework in fewer than five semesters. Why choose the Ohio University online MEM? An advanced degree program for engineers who want to become leaders without losing their foundation in engineering, the online Master of Engineering Management from Ohio University focuses on leadership and management skills and their direct relationship to engineering process improvement, project management, effective communication, and innovative solutions. Delivered through a completely online learning environment, our curriculum combines graduate-level leadership and management courses with high-level engineering practices. The curriculum’s dual focus is ideal for immediate application in the workplace, or for career advancement opportunities down the line. Our MEM graduates rely on their understanding of protocols and project standards, superior communication skills and leadership abilities to manage cross-functional teams effectively to find solutions. We cover concepts beneficial in any leadership role, whether you’re a chemical, electrical, civil, or mechanical engineer, or have a strong background in physical science and desire to excel in the design, implementation, and management of technology. The objective of this course is to teach engineers the management skills they will need to be effective throughout their careers.It introduces the ways in which management principles are applied in the kinds of work students are most likely to encounter.Also included are aspects of globalization, including how culture changes engineering management. This course is designed to help you develop the ability to think critically as a professional communicator.Learning to ask appropriate questions will enable you to understand, develop, and produce effective communication using the following elements of thought: purpose, basic concepts, information sources and needs, underlying assumptions, inferences/conclusions, implications/consequences, and points of view.Significant ethics discussions are included throughout this course. This course is intended to prepare engineering management students to design statistically valid experiments and to analyze the results.Topics include basic probability theory, confidence, hypothesis testing, regression, and analysis of variance. This course introduces students to information systems within and across organizations.Information systems provide a primary source of information for management.Students learn about the phases of design and implementation of information systems, as well as methods for keeping abreast of fast-paced changes in the IT world. This course focuses on the development and utilization of network techniques, such as PERT and CPM, to schedule activities, develop financial budgets, allocate resources, and control progress and costs of practical projects. Students also are introduced to project scheduling software. This course presents an introduction to the Six Sigma DMAIC problem-solving methodology, including examples in a wide range of organizations.Topics include tools and techniques for product and process improvement, and the application of basic and advanced statistics to problem solving. This course focuses on the concepts of total quality management, including philosophies and frameworks of quality management; incorporating quality into strategic planning; leadership, process measurement and management; continuous quality improvement and ISO 9000.Original writings by major figures in the quality movement, such as Deming, Juran, Taguchi, and others are discussed. This course presents methods and procedures for storing and retrieving manufacturing data in large computerized databases.It also covers the entity relationship modeling of database systems using common notation. Topics include database design, normalization, and SQL. Students will build a database using MS Access as a project. This course focuses on the study of those parts of the legal system that relate to engineering.Topics include domestic and international environments of intellectual property policy (including patents, trademarks, copyrights, and trade secrets); torts and various sources of personal, facility, products, and enterprise liability; contracts and issues arising from various types of contractual relationships; and aspects of administrative law (dealing with agencies) and employment law. The objective of this course is to teach students modern methods for data analysis and predictive analytics. Students will gain the knowledge to develop advanced queries and apply statistical methods and machine learning to analyze the data and make predictions in the engineering management context. 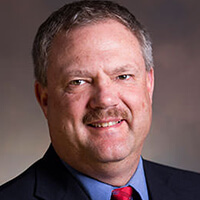 The objective of this course is to teach students tools for applying lean thinking, lean principles and lean methods in manufacturing and service systems. Students will learn basic methods of the lean production, such as value -stream mapping, 5(6) -S, continuous flow, Kanban, SMED, A3, continuous improvement. This course will provide information, experiences and skill development to aid the student in creating an inventory of leadership knowledge for lifelong development of effective leadership abilities. Students will accomplish this through selected readings, supplemental videos, interviews of experienced leaders, reflections and discussions to explore, develop, and reinforce leadership development. Students are required to work on a project of their choice in this course.Though not mandatory, they are encouraged to select a real-world engineering problem they are facing in their job.Students will report on their project problems, solutions, analyses, results, discussions, and conclusions. Engineering managers are employed in a number of different industries, from manufacturing and architecture to mining, scientific research, and government. 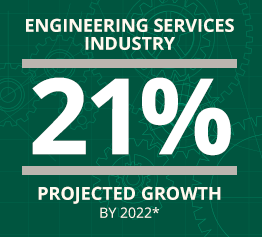 Though the engineering services industry is projected to grow by 21% by 2022*, you can expect strong competition for openings. Education and experience are crucial distinguishing factors. In a management role, you may be expected to lead research and development teams to discover new processes, ensure sound methodology, check the technical accuracy of your team’s work, and manage a project’s budget and timeline effectively. Average wages for engineering managers vary depending on the industry, your experience, and your education, among other factors. 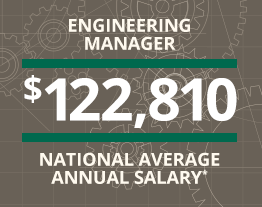 The national average annual salary for engineering managers is $122,810*. As a graduate of the Master in Engineering Management program, you can enter the marketplace with the tangible credentials and intangible leadership qualities to help push your career forward. Based on a 2013-2014 survey, our MEM grads are already seeing demonstrable benefits in the industry. Staying competitive is paramount, and 88% of graduates agreed the MEM helped them become more competitive in the job market. With increased competition comes increased opportunities, and 63% of grads said their MEM helped them move into a management or supervisory position. 66% of MEM grads reported a salary increase of 40% or more.